The average American owns at least three credit cards, two retail cards, and multiple bank checking or savings accounts. In addition, there are mortgage accounts, investment accounts, and 401(k). How do you manage your money across different accounts? I used to log into my bank accounts, credit card accounts, and investment account separately every month to record the balance at each individual account and do a manual sum of my net worth. It takes time and efforts and sometime the calculation is not error free. 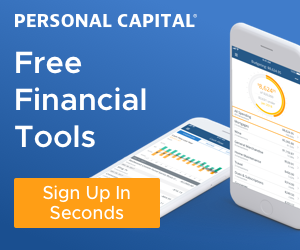 I have been looking for a tool that can help me manage my money more easily and accurately until I found Personal Capital. I have been using Personal Capital since 2017 and really love it. Personal Capital is a financial aggregator to show all of your financial accounts on one platform. You can link it to your investments, savings, checking, credit cards and other accounts. It was founded in 2011 by Bill Harris, former CEO of Intuit and PayPal. More than 1.9 million users are using Personal Capital to manage their entire financial life. Personal Capitalis free to sign up. At no additional cost, Personal Capital provides you a financial dashboard where you can calculate your net worth, set a budget, manage investment accounts, and plan for retirement through one secure interface. It offers an optional asset management service in the premium version, which include professional financial advice and the ability to work with a financial adviser. For premium version, the fee is 0.89% or less depending on the amount of your investment and your investments will then be actively managed by Personal Capital’s investment advisers. • Net Worth: Your total net worth is a single number calculated by adding what you have (assets) and subtracting what you owe (liabilities). The net worth is shown in both left bar and top widget with graph display in the dashboard. • Cash Flow: Cash flow is the net amount of cash transport in/out your accounts. It is the difference between what you have earned (income) and what you have spent (expense) in last 30 days. • Budgeting: All your spending is shown on one platform and categorized by types. You can view not only the overall spending in each category but also individual transactions. In addition, you can setup your monthly budget target to see how much you have achieved your goal. • Portfolio Balance: It summarizes all your investment accounts and gives you a total balance. • Investable Cash: This is a new feature that shows how much cash available in your bank and investment accounts to invest. • Market Movers: Your portfolio performance is summarized into a single number called “You Index” which is compared to the market index such as S&P 500, DOW, etc. • Market Recap: The advisers at Personal Capital summarize the week’s events and provide you a weekly market digest and outlook along with blog highlights. • Retirement Savings: It is a summary of your retirement saving to date, and the graph shows how far away you can reach your goal. You can modify your retirement saving goal by clicking the pencil icon in the graph. 1- It’s read-only. Unlike other banking/brokerage account where you can log in and maneuver money in/out your bank, Personal Capital only allows you view the data and no money can be transferred out of your banking/brokerage account via Personal Capital. This feature makes Personal Capital not an appealing target to hackers since they cannot steal your money by hacking into your account. 2- It uses 256-bit bank-level encryption keys, known as AES (Advanced Encryption Standard) that is computationally secure against brute-force attack. In addition, Personal Capital requires a two-factor authentication where you’re required to provide another layer of authentication in addition to your password. 3- Logging into multiple banking/brokerage sites from your browser may not be as safe as connect to a single secured Personal Capital account. Each time you log into your bank through your browser, you transmit your bank credentials and increase the risk of being hacked. However, as one point of access, Personal Capital doesn’t require you to enter every individual bank credential once you connect to Personal Capital. It reduces the risk of potentially being hacked when you try to log into multiple accounts. Speaking risks, nobody can claim they are 100% safe. Personal Capital is not 100% safe as well. You will need to weight in the benefit the new tool can give to you and your tolerance of risks. I love all the free features Personal Capital provides to me which makes my life much easier. I had been approached by their advisers on their premium service for asset management. I am still debating whether I need to pay for their investment advice. But right now I am satisfied with the free version and will continue use their products. Sign up Personal Capital today and you won’t regret it. Great article! This information came at the right time. I was looking for something like this. the artilce is informative and grounded. thank you for taking the time to share this information.